It has been a few years (2010 to be precise) since the Firebird marque (along with the entire Pontiac lineup) was tossed away like a used Volkswagen coil pack. 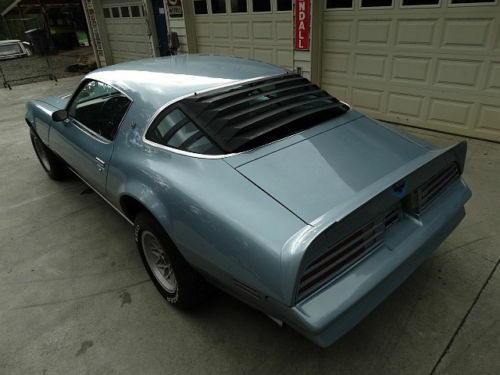 Pontiac enthusiasts and 80s detective show enthusiasts alike will gravitate toward the Rockford era Firebird Forumla...and that isn't a bad thing at all because the Thunderchicken is the greatest thing to ever be on the hood of an automobile. 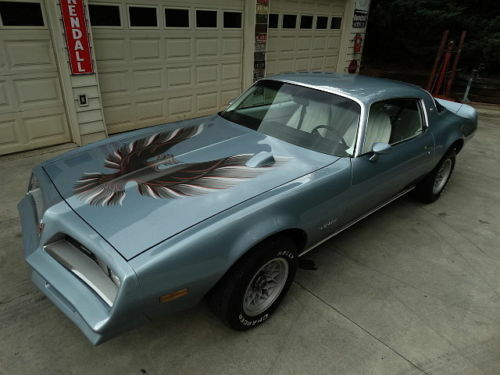 Find this 1978 Pontiac Firebird here on eBay offered for $9,999 in Athens, TN. HISTORY: The title is a clear and clean Tennessee. The car has lived within 20 miles of me since it was new. I have a copy of the original Tennessee title from 1978. HOW IS THE PAINT? I love the silver blue metallic color. The car has been repaint and looks very good. I see no dents or dings, a couple of touched up chips, the shine is brilliant, the car is not wavy down the sides, the paint is not cloudy, a very tiny amount of orange peel. HOW ABOUT RUST? I see no rust bubbles in the paint and the underside looks very solid to me. HOW IS THE INTERIOR? Good looking white interior, dash pad has no cracks, carpet good, seat covers decent, door panels some minor waves, headliner good. HOW IS THE GLASS? Clear windshield, no stone chips or cracks, side glasses roll up and down good. THE AIR CONDITIONING DOES WORK, it is converted to modern gas. HOW IS THE ENGINE? A good running 305 V8. I hear no knocks or unwanted rattles, it starts good, it is clean and was rebuilt, but we have no documentation. HEAD LIGHTS WORK! TAIL LIGHTS! INTERIOR OVER HEAD LIGHT WORKS! GAS GAUGE WORKS! OIL GAUGE WORKS! HOW IS THE TRANSMISSION? Its a dependable Turbo 350, 3 speed automatic and it feels good to me. HOW ARE THE TIRES? Good tires on factory wheels. HOW DOES THE CAR DRIVE? It drives very good to me, IT IS POWER STEERING. HOW DOES THE CAR STOP? Good, it is disc in front and power. WHERE IS THE CAR LOCATED? Athens, Tennessee 37303. The rear window louvers I could almost live with. The tachometer on the hood is just too wrong. If you want it to look like Pontiac put it there,wouldn't the chicken graphics be on top of it and not underneath it? The tach is factory, and was an available option on GTO and Firebird from 1969 onward. The decal placement is correct - the tach was installed after the decal was in-place from the factory. What would look really goofy is the decal placed over the installed tach! The hood tachometer was never offered by the factory on any model 1978 Firebird. Yes, it was. The TransAm had it in the dash, but the Formula offered it as a hood tach. I was inn high school when these were new and worked at a GMC/Pontiac dealer then. Saw this exact thing on a few occasions. Patrick factory installed and dealer installed are two different things. It's possible that the dealership you worked at installed hood tachometers. My buddy owned a 1977 Formula 400. Please feel free to post a link to show that Pontiac factory installed these. I searched for the past hour with no luck. I don't have a link, just real-world experience from the days pre-interwebz.